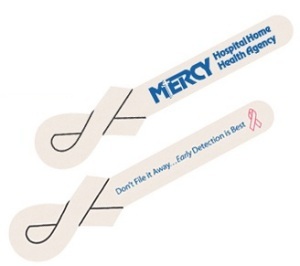 Let us help you promote your cause or awareness program with these custom horizontal ribbon-shaped emery boards. Use different color ribbons for different causes and awareness programs. These horizontal ribbon-shaped emery boards are 4-1/2" x 1-1/4". There is no additional die charge for this custom shape emery board. The imprint area of the emery board is 3/4" wide x 1/4" high for the ribbon shape and 2-1/2" wide x 3/8" high for the file length. Select from natural, pink or yellow paper backgrounds. Shipping and handling is free (ground shipping with the USA)! 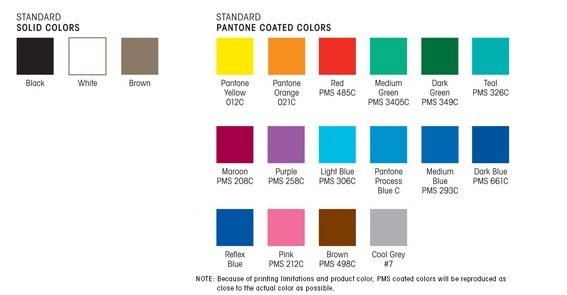 An additional $30 per color, non-refundable artwork charge must be paid before work can begin. PINK RIBBON - The breast cancer pink ribbon has become an instantly recognizable symbol for supporting breast cancer awareness. RED RIBBON - The red ribbon is a symbol for both drug prevention and for the fight against AIDS. TEAL RIBBON - Teal raises awareness for ovarian cancer, food allergies, and sexual assault and substance abuse. BLUE RIBBON - The blue ribbon serves as a constant reminder to fight for the protection of children. PURPLE RIBBON - Purple raises awareness for Pulmonary hypertension, Domestic violence, and Pancreatic cancer. GREEN RIBBON - The green ribbon is used for many campaigns, including environmental justice, cancer and agriculture. YELLOW RIBBON - A yellow ribbon is associated with those waiting for the return of a loved one or of military troops.